Helping you save time and money and become paperless with quick, highly accurate automated data capture. Xtracta provides technology, powered by artificial intelligence, that automatically captures data from documents, whether they are scanned, photographed or digital. The technology can be embedded into virtually any software application via our easy to use API. Using machine learning and Big Data, Xtracta doesn’t require manual template setup and can scale to a limitless count of document designs – perfect for document types like invoices, receipts, contracts and more. Simple setup with no template configuration. Remove manual data entry and, with a copy of the original document also sent to your software, become paperless – no more chasing paper documents around the office or filing and retrieving paper. No error-prone manual data entry, simply let Xtracta capture the data you want and deliver it how you want it in seconds. Plus data matching tools provide extra validation. Improve visibility and control over your process – whether it accounts payable, expense management, proof of purchase or more. Streamline processes, spend time on what is important and make decisions quicker with real time reporting and tracking. Mine existing documents and bring Big Data to life in your organisation. Powered by artificial intelligence (AI) and machine learning, Xtracta constantly learns with every document processed – enabling the automated data extraction from any number of document designs in dozens of languages. So unlike traditional optical character recognition (OCR) engines, no templates are required – just set and forget. Improve productivity and job satisfaction with staff focussing on higher value work. Remove the costs of data entry or complex and expensive electronic data interchange (EDI) and combine with cost effective per document pricing for a super quick ROI. Quickly deploy automated data capture into your own software with our easy to use API, image capture SDK, mobile app and one-on-one developer support. Our API supports both desktop and cloud products and can integrate with virtually any software. No error-prone manual data entry, simply let Xtracta capture the data you want and deliver it how you want it in seconds. Plus data matching tools, like PO matching, provides extra validation. Improve visibility and control over your process – whether it accounts payable, expense management, proof of purchase or more. 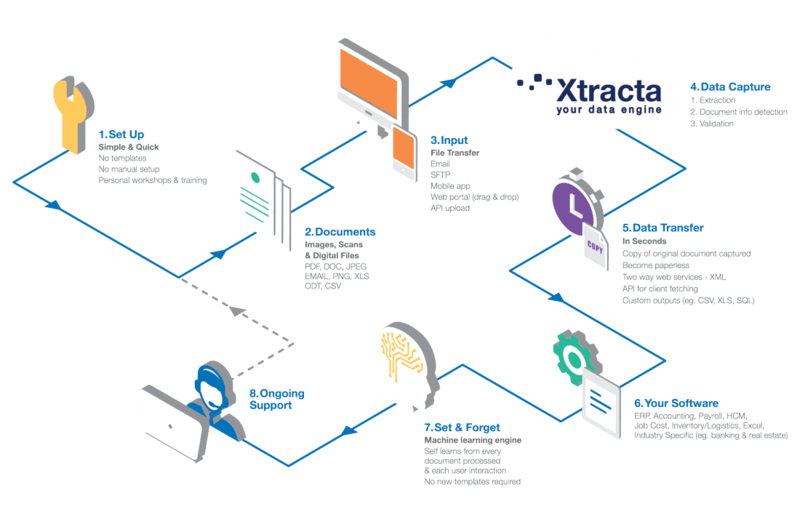 Powered by artificial intelligence (AI) and machine learning, Xtracta constantly learns with every document processed – enabling the automated data extraction from any number of document designs in any language. So unlike traditional optical character recognition (OCR) engines, no templates are required – just set and forget. Want to add touchless data capture of high volume documents, like invoices and receipts, to the software you use? We have partners ready to help you. Join our global partner network. Get everything you need to sell Xtracta and help your customers automate their data capture. Want to into integrate Xtracta with your own software? Use our easy to use API and image capture SDK and brand the functionality as your own.